1. 본 앱은 개인 개발자에 의해 제공되는 것이며 각 지역시의 BIS 데이터를토대로 개발하였습니다. 2. 본 앱은 광양, 여수, 순천의 시내버스의 현재 위치, 노선별 버스 위치를 제공해드립니다. 3. 여수 지역 정류장 정보는 지역시스템상 개선이 어렵습니다. 본어플리케이션에서 사용하는 GPS정보는 저장되거나 전송되지 않습니다.여수 버스 정보 어플리케이션 입니다.v1.0.01. 자신의 위치 주변의 정류장 정보를 보여줍니다.2. 맵을 옮겨가면 주변의 정류장 정보가 나타납니다.3. 북마크를 이용해 자주 이용하는 정류장을 저장할 수 있습니다.4. 북마크는 버스, 정류장을 가리지 않고 저장할 수 있습니다.5. 길게 누르면 북마크에 저장된 이름을 변경할 수 있습니다.6. 버스 노선의 어느 정류장에 버스가 위치해 있는지 확인할 수 있습니다.7. 버스가 출발지에서 몇시에 출발하는지 확인할 수 있습니다.8. 현재 최신 데이터베이스가 내장되어 있습니다.9. 버스 정보 리스트를 당겨서 새로고침해 보세요.10. 검색은 정류장, 버스를 가리지 않습니다.11. 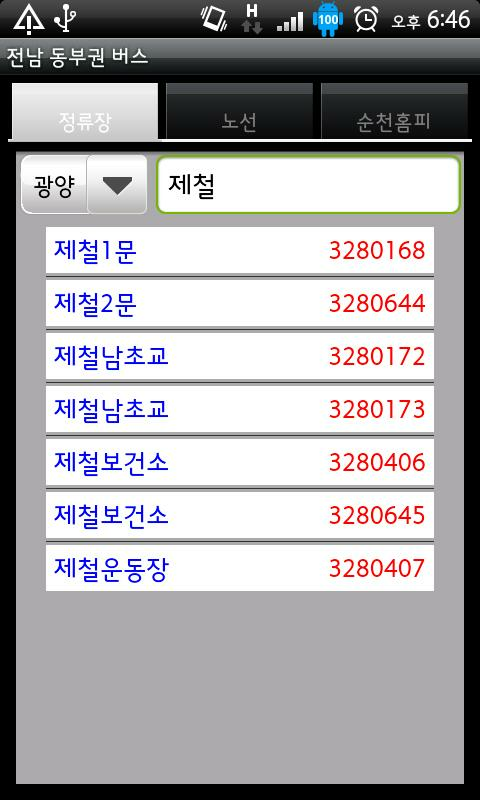 옵션 메뉴에서 GPS를 설정할 수 있습니다.12. 최근에 검색했던 기록을 저장합니다.13. 설정에서 언제부터 진동으로 버스도착을 알려줄지 설정할 수 있습니다.14. 갤럭시 시리즈의 멀티윈도우 기능을 지원합니다.15. 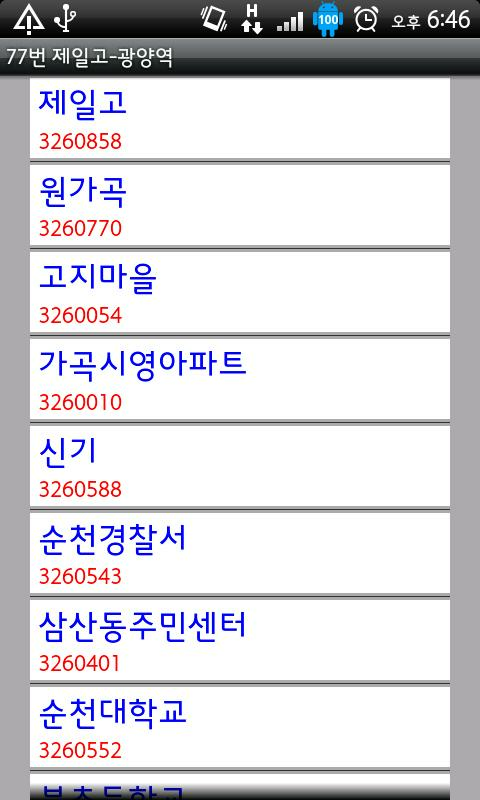 정류장 정보의 자동 새로고침 기능을 추가했습니다.16. 시작화면을 지도 혹은 북마크로 설정할 수 있습니다.----개발자 연락처 :이메일 문의 : [email protected] this applicationthatuses GPS information will not be stored or transmitted.Yeosu bus applications.v1.0.01 Stop shows around their position.2 Go around stop moving map information appears.3 You can save your favorite stop using bookmarks.4 Bookmark the bus stop can save any5 Press and hold to change the name stored in the bookmark.6 You can check to see if any of the bus routes busstoplocated7 Can determine whether the bus departure time departure from8 The latest database is built.9 Pull the bus list refresh your10 Search the bus stop, they do not obscure the11 From the Options menu, you can set up the GPS.12 Recent search records.13 Set from time bus arrival from vibration can set shew.14 Galaxy series of multi-window support.15 Stop information auto-refresh feature has been added.16 Start the map or the screen can be set as a bookmark. 이 프로그램은 여수시의 교통상황, CCTV정보, 버스정보를 제공하는 프로그램입니다.This program of Yeosutraffic, CCTV information, is a program that provides businformation. 본 어플리케이션은 여수시 버스도착정보를 제공합니다. 정류장의 버스도착정보는 실시간으로 변동되어지며 조회하는 시점을기준으로 제공되는 도착정보가 없을시 표시되지 않습니다. 여수시에서 제공되는 버스정보를 참조하기 때문에 여수시버스정보시스템의 서버 사정에 따라 정보가 제공되지 않을 수 있습니다. 주요기능 - 즐겨찾기 (노선,정류장) - 버스노선검색 - 버스노선의 전체 버스 위치 정보 - 버스노선의 정류장 위치정보 - 정류장 검색 - 정류장 음성 검색 - 위치기반정류장 검색 - 정류장의 버스 도착 정보 - 정류장의 버스 도착 알람 - 정류장의 위치정보 - 환승 노선 검색 -최신DB 업데이트 알람 - 정류장 주변 생활편의 업체 정보 검색 필수 접근 권한 안내 * 저장공간 : 버스 노선 DB를저장함. 선택 접근권한 안내 * 위치 : 주변 정류장 위치를 검색함. * 선택적 접근권한의 허용에는 동의하지 않아도서비스 이용이 가능함. 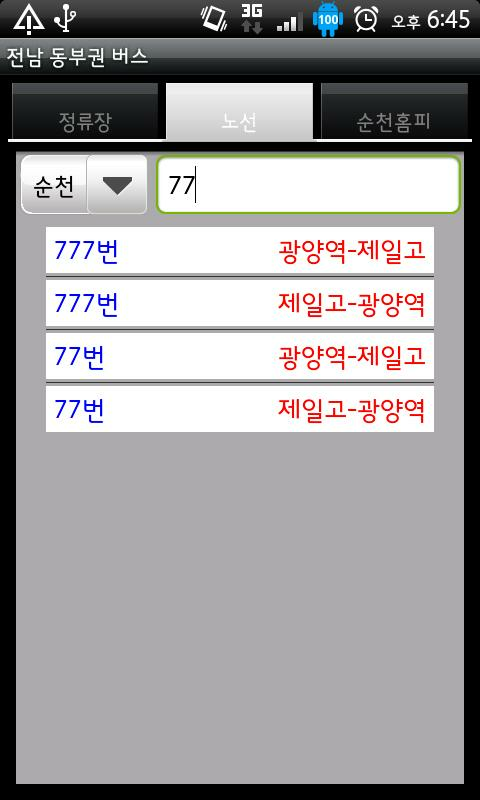 This application provides Yeosu bus arrivalinformation. Stop the bus arrival information is not displayed whenno destination information provided at the time of the querybecomes the variation in real time. Because they see the businformation provided in Yeosu, depending on the server situation inYeosu bus information system it can not provide the information.main function - Favorites (routes, stops) Search a bus route -whole bus location information of the bus routes - stop locationfor bus routes - Stop Searching - Stop Voice Search -Location-based station search - Stop the bus arrival information -Stop the bus arrival alarms - station location information of -transit route search - Latest Updates DB alarm - Browse listings ofstations around the Everyday tips Mandatory access guide * Storage:Stores the buses DB. Select access guide * Location: Discoversperipheral stop position. * The services available do not agreeallow selective access. 순천 시내 버스 정보 안내 어플 입니다.버스노선, 정류장, 환승정보, 맞춤정보, 운행시간표, 이용안내 의 메뉴로 구성되어 있습니다. 각 메뉴를 터치하여 원하는정보를 쉽게 찾아 보실수 있습니다.Suncheon City BusInformation Guide app.Bus routes, stops, transit information, custom information,timetables, menus consist of the User Guide. Touch the desiredinformation for each menu can be found easily. 많은 지역을 지원하는 안드로이드용 버스 정보 앱입니다! - 버스 노선 정보 조회 - 정류소 정보 조회 - 내 주변 조회- 정류소 지도 및 장소, 주소 검색 - 실시간 버스 도착 정보 조회 기능을 제공하는 앱입니다. 지원 지역: 서울,인천, 부산, 대전, 대구, 광주, 울산, 세종 경기도, 제주도, 강원 강릉, 고성, 동해, 삼척, 속초, 양구, 양양,영월, 원주, 인제, 정선, 철원, 춘천, 홍천, 태백, 평창, 화천 경남 거제, 김해, 밀양, 사천, 양산, 진주,창원, 통영 경북 경산, 경주, 구미, 김천, 영주, 칠곡, 포항 전남 강진, 광양, 나주, 담양, 목포, 무안, 보성,순천, 신안, 여수, 영광, 영암, 함평, 화순 전북 군산, 순창, 익산, 임실, 전주, 정읍 충남 공주, 논산, 부여,아산 충북 제천, 천안, 청주, 충주 선택적 접근권한 안내 - 위치 정보: 현 위치 주변 정류소를 검색할 수 있음 -저장공간: 즐겨찾기에 등록된 항목을 백업/복원할 수 있읍 * 선택적 접근권한을 허용하지 않아도 서비스 이용이 가능함 *오류 제보는 [email protected] 로 해주시기 바랍니다. 오류를 제보해주실 때는 주로 이용하시는 지역명,정류소명, 노선명을 함께 알려주시면 해결에 큰 도움이 됩니다. It is a bus information app forAndroid that supports many areas! - Bus route information inquiry -Information on stop - Look around you - Map of stop, place, addresssearch - Real-time bus arrival information inquiry This appprovides functionality. Supported areas: Seoul, Incheon, Busan,Daejeon, Daegu, Gwangju, Ulsan, Sejong Gyeonggi-do, Jeju Island,Kangnung, Goseong, Donghae, Samcheok, Sokcho, Yanggu, Yangyang,Yeongwol, Wonju, Inje, Jeongseon, Cheorwon, Chuncheon, Hongcheon,Taebaek, Pyeongchang, Hwacheon Gyeongnam, Geoje, Gimhae, Miryang,Sacheon, Yangsan, Jinju, Changwon, Tongyeong Gyeongbuk Gyeongsan,Gyeongju, Gumi, Gimcheon, Youngju, Chilgok, Pohang Jeonnam Gangjin,Gwangyang, Naju, Damyang, Mokpo, Muan, Boseong, Suncheon, Shinan,Yeosu, Yeonggwang, Yeongam, Hampyeong, Hwasun Jeonbuk Gunsan,Sunchang, Iksan, Imsil, Jeonju, Jeongeup Gongju, Chungnam, Nonsan,Buyeo, Asan Chungbuk Jecheon, Cheonan, Cheongju, Chungju OptionalAccess Rights - Location information: You can search for stops nearthe current location - Storage space: You can backup / restoreitems registered in favorites * Service is available withoutoptional access privileges * Please report the error [email protected] When you report an error, please let us knowthe name of the area you are using, the name of the stop, and thename of the route.